Up your game and focus harder with the X SIght Pro archery shooting glasses. Designed specifically to maximise your field of vision and minimise obstruction. 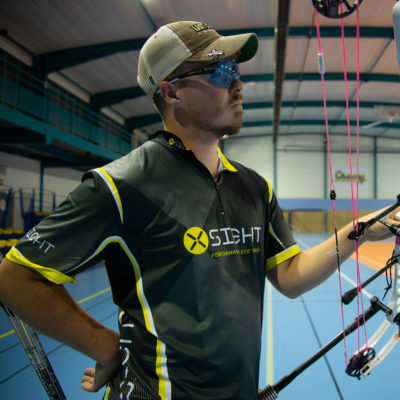 With specific lenses designed to relax your eyes and enhance your shooting experience in different conditions, by using X Sight Pro archery shooting glasses, you can ultimately help improve consistency and the quality of your shooting technique. Change your lens to suit the ambient conditions or help subdue or emphasize the appearance of certain colours on the target and on the range. Offering maximum cover and peripheral vision at full draw for a clear unobstructed view of the target. Specifically designed to be used without a nose pad ensuring lens to skin contact around the nose so there is nothing to obstruct your sight picture. 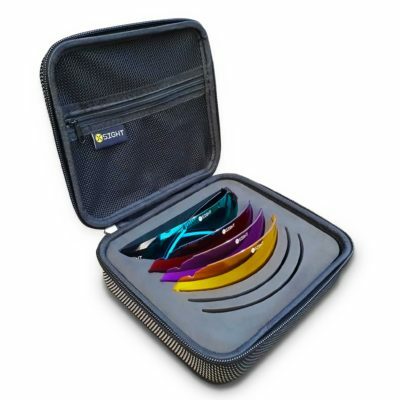 Designed to fit all shapes and sizes, the flexible arms contour comfortably around the head with the added stability of silicon anti-slip pads to make sure the glasses stay secure. Made of a strong polycarbonate which is up to 10 times more impact-resistant than standard plastic or glass lenses. Change your lens to suit the conditions whether you’re shooting in low light, medium light or bright light. The lightweight design of X sight sunglasses provides maximum comfort and helps reduce all felt weight on the bridge of the nose. You’ll forget you’re wearing them. Filter blue light and decrease eye fatigue resulting in improved mental and visual focus over longer periods. By not squinting you relax your facial muscles during your shot with aids consistency. 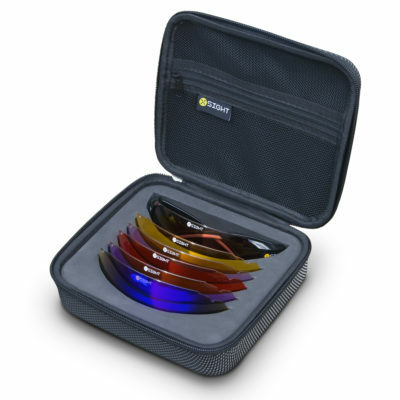 100% UV lens technology, absorbing harmful UVA and UVB rays. X sight archery glasses have taken my shooting to a whole new level. The glasses are extremely well made and easy to use. The lenses are large which gives me a perfect all-around unobstructed vision of the target and stops light entering the top. Having no nose piece was important for me, so nothing interferes with my line of sight. Not only do they help me focus but they keep my eyes relaxed all day. Having access to different colors and light transmissions has allowed me to tailor my shooting glasses to what is needed for the situation be it bright sun or overcast to light variances on an indoor range. I have more control. The glasses themselves are lightweight and wrap completely allowing for uniform color no matter which part of the lens I’m looking out of with no gaps, especially around the nose. Subscribe to the X Sight Archery mailing list now and be the first to find out about product updates, news, special offers and more.